Instruments and control for grain producers. Abstracted with permission from the Siemens "For the Love of Grain" article. View the complete document at the bottom of this post or download it from Ives Equipment here. A successful grain merchant during the 1840s is considering expansion in the coming years. Recent years have been fruitful, but there are rumors of a new invention on the market: a grain elevator. Claims are that this elevator is able to unload more than 1,000 bushels each hour! Compare this to current operations where workers carry sacks of grain on their backs from wagons to waiting ships. Our grain merchant has seen firsthand the hazards of this process – everything from suffocating and explosive grain dust to the daily stresses on workers’ bodies. Will this new technology be able to increase the merchant’s profits as well as make a safer working environment for employees? Over a century and a half later, mechanized equipment is now an essential part of the grain industry, from planting and growing to harvesting, handling, and milling grain. Your challenges are still the same as those of nineteenth century grain operators, though – how can you improve processes and cut costs while also increasing safety? Working with grain has the potential to be deadly, especially when grain is in motion. Similar to ‘quicksand,’ moving grain can bury a worker in seconds. In 2010, U.S. grain operators reported that fifty-one workers had been trapped in grain, more than in any year since Purdue University began collecting data on grain entrapments in 1978. Sadly, almost half of these entrapments led to fatalities. To prevent deadly occurrences such as these, the grain industry is increasingly taking steps to reduce grain handling and storage hazards. 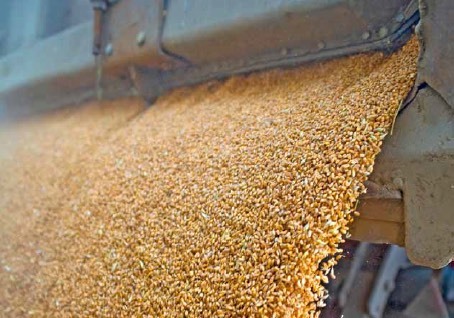 Improving efficiency in grain facilities through automation is becoming a growing industry trend. A concern for safety is one driver behind automating operations, as a reduction in human interactions with grain decreases the occurrence of accidents. Another reason for the push towards automation is that owners are constantly looking to increase production and reduce expenses while still producing a high quality product. A solution is to invest in automated processes in a facility. Many facilities have moved to complete automation of production, termed Totally Integrated Automation (TIA). Tracking inventory in grain silos is a significant component of a successful grain operation. Managing raw materials and finished products is essential for keeping processes efficient and optimizing inventory ordering and shipments. By knowing where materials are located, companies can use these resources more effectively, decreasing human intervention and increasing efficiency. As well, checking bin levels on a regular basis requires substantial labor costs. To make inventory track-ing faster and more streamlined, the industry is continually moving towards automated inventory management.